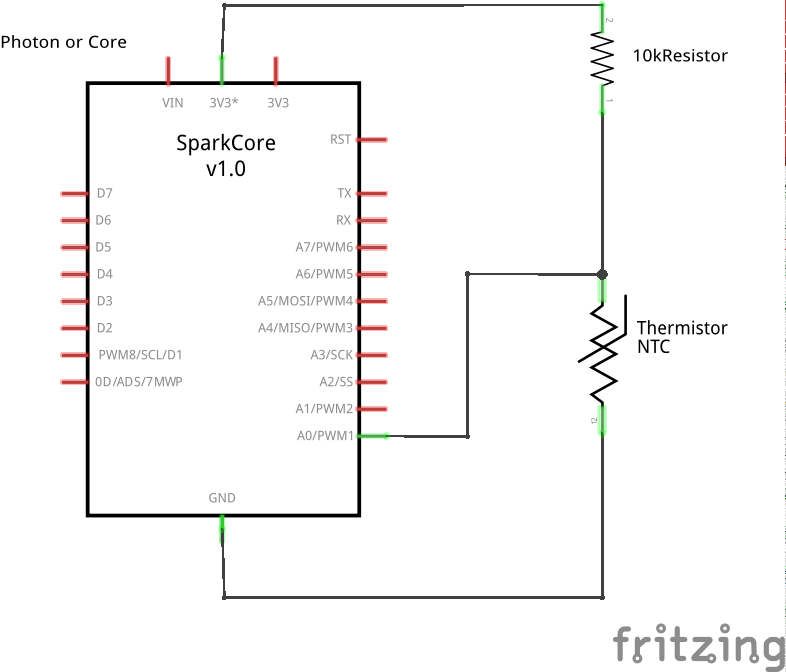 The first time I saw the Kickstarter campaign for the Spark Core (now Particle Core or Photon), I knew I would want to use one of those wifi development kits. This summer, our pool gave me a perfect excuse to just do that. what is the temperature of the water? is my family's favorite question on a hot summer day. It happens that the thermostat of the pool, the one that comes with the heat pump, is on the other side of my backyard. I have to walk all around the pool in order to just answer it. So why not build a wifi connected pool temperature monitor to answer that question in seconds? And at the same time, why not store that data on a Google Sheet to see how much temperature does the pool lose during every night? or how fast the temperature raises in the morning? 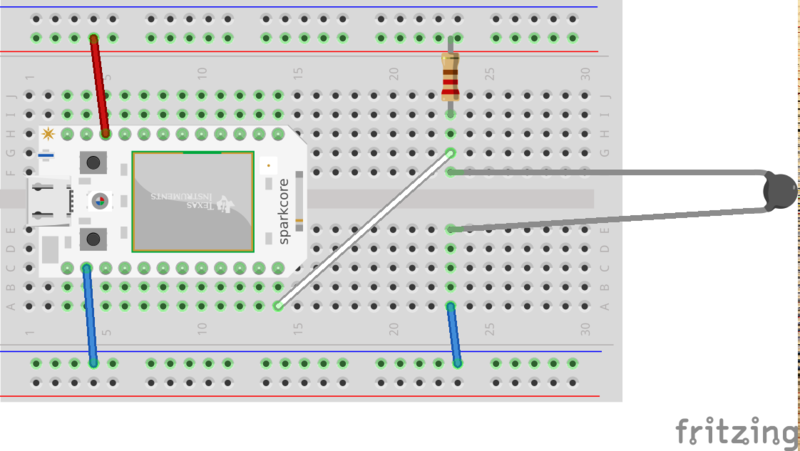 In this project we will use a thermistor to measure the temperature, and the Particle Core or Photon, from now on the Particle, to get this info in the internet, and then, in our phones. The thermistor can be placed in a number of places. I chose the skimmer, since it allows me to hide it a little bit. I drilled a little hole in the pool wall (above the water level) that fits behind the plate of the skimmer so nobody can see it. Then did a small incision in the skimmer plate for the head of the thermistor to touch the water on one of the bottom corners. Since I intend to reuse the Particle for other projects, I placed mine in the basement of the house. Then ran a wire all the way to the side of the pool, where the thermistor wire ends. For this we are going to use IFTTT. We will combine two elements here. A DO button calls a function in the Particle which in turn publishes the current temperature. Then this IF Recipe will trigger once the Particle publishes the current temperature and pushes a notification to our phone. For all this to work, you have to install in your phone the DO button and the IF apps. Create this recipe in your IFTTT. If you are a Pushbullet user (Pushbullet app required), then you can use this recipe instead. The notifications look similar and the delivery time to your phone is around 5 seconds for both. If you like notifications in your browser, the pushbullet extension in your Chrome browser would help you get the temperature there too. Once the IF recipe and the DO button are in place, you are ready to go. Hit the DO button and few seconds after you will receive a notification with the current temperature of your pool! This section is optional! You can choose to skip it and everything will work fine. Please follow the steps described in this article if you want to store the temperature data in a Google Sheet. I think this could be useful to see how the temperature of your pool behaves whether you cover it at night or not. With this information, you could decide to not go through the pain of covering it! So, what is the temperature of the water? You can now answer this one in a matter of seconds, even if you are not home! I sometimes experience delays of 10 seconds when I hit the "Get the temperature of the pool" button. Since it is a free service for now, and I'm not complaining here, their recipes may stop working from time to time, or last month (sept 2015), like every other Sunday. If we want something more reliable, maybe IFTTT is not the way to go... (ok, that was a complain). What if you are the lucky owner of a spa too? What if you want to know the both temperature of your pool and your spa? 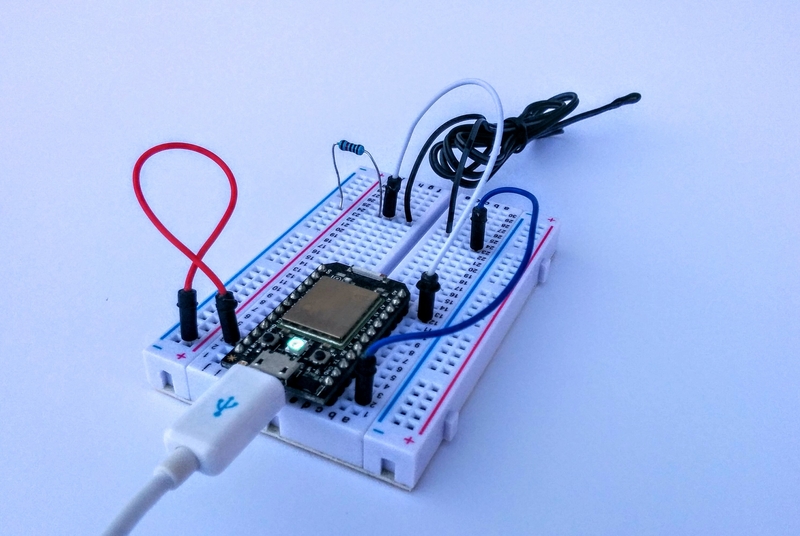 Since the Particle Photon has 8 analog inputs, you could wire more thermistors and update the firmware to read them and put that info in your phone too. So, did you build something similar? are you planning to? any questions? Psst: please find my other projects here. You can now display temperatures in Fahrenheit. There was an issue with decimals when showing negative temperatures. For instance, the pushbullet notifications were showing -6.-76 instead of -6.76. Paste this code in Particle Build and flash it! Thanks to David Gatti, Adafruit, The Particle team, my wife, Hackster, and Rick Troiani.